today i chucked the flowers i received for my birthday in the garbage can. it’s been more than a week since my birthday. a week since the party that was thrown by my partner and friends, to celebrate my life. or the beginning of it, should we believe the tired adage. everyday, since that day (after recovering from the hangover that tails every good party, that is), i open my blogspot account and attempt to write a post, something to mark my official entry to the rank of middle ages. i review my earlier posts to the point that i re-read everything i’ve written since i started this blog. i consider regurgitating earlier posts but felt like a phony and stopped myself in time from committing self-plagiarism. i combed through the recent and not so recent posts of my favourite writers in my blogroll. like always, their words bring inspiration, smiles and vicarious heartbreak, and yet they failed getting my fingers active on the keyboard to appropriately punctuate this (subjectively) momentous occasion. i realised that i heard this question posed to me more often in the last few days than i can ever remember. definitely more times than i can come up with answers that resonates the truth rather than those resembling the lines beauty pageant contestants spew out to impress judges ready to make a mark on their scoreboards. somehow i felt like i would let people down and get a failing mark if i give the ambiguous truth and thereby respond with less bravado than expected. the thing is, this age thing, it doesn’t make you more wise or witty or profound. it definitely does not make you happier. truth be told, it doesn’t make you sadder, either. it just makes you, well, older. it is rather disconcerting to realise that this new leaf that i turned did not come with an earth-shaking epiphany, not even a startlingly fresh insight. it did not come with a wave of joy nor a surge of sadness. it just came to pass. as i wash the vase that reeked something terrible, i was hit by panic that maybe there was a card enclosed with the flowers that i missed and unwittingly chucked in the bin. i took out the bin from the cubbyhole below the sink. like a bag lady, i opened the garbage can and looked for what i discarded. i examined the flowers. while wilted, they still looked hopeful and uncrushed by the move from vase to bin. i started to think of all the affection, well wishes and good intentions that so many people extended in the last few days. i realised they were far more than the questions that wait for answers that dread the imminent scorecard. 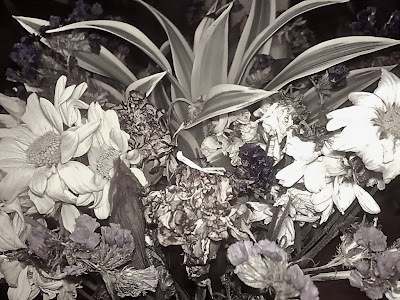 the wilted flowers' tenacity trumped my cynicism. there was a message there – but it wasn’t in a card. i put the bin back and dried the vase, mentally embracing the people that signifies everything that is good in my life. lyka, i may be fucked up. but for now, i am thankful. "the thing is, this age thing, it doesn’t make you more wise or witty or profound. it definitely does not make you happier. truth be told, it doesn’t make you sadder, either. it just makes you, well, older." -- Win!!! You're always soooo pragmatic. Love it! Belated happy bday, ineng (yan, i did not say 'ate' ha). @ lof - i see it as an upside. @ boying - leche ka. aagawin ko sa iyo si bogs makita mo. where shall i send the oscar de la renta dress, dahling? @ fuchsiaboy - wag na ODLR. DP Kiel na lang. yey! @ cherry - oks lang. better late than... later?! Binyag lang pala ang katapat! Go!